The Ironmaster Super bench is a heavy duty bench that is full adjustable and comes with a ton of attachment like no other adjustable bench. Check them out below. It’s sleek. It’s heavy-duty. It’s a one-stop shop for working out at home! The Ironmaster Super Bench Adjustable Weight-Lifting Bench is one of a kind. You certainly won’t be short of workout options with this weight bench. It’s one hell of a heavy duty bench that you can throw some serious weight around on it. This is a bench for someone who is tired of cheap flimsy weight benches and wants something solid to bench and do inclines on. Let’s check out why you would want this bad boy for your home gym below. You can jump over to amazon right away for the best prices and customer reviews if you are in a hurry >right here. This bench is one of the most versatile weight-lifting benches out there with 11 different angles to choose from – 0°, 5°, 10°, 20°, 30°, 40°, 50°, 60°, 70°, 80°, and 85°. You can even use this for decline bench press as well if you buy an attachment for it. A unique feature is the way this bench adjusts to the different angles – it uses a foot lever so you can easily change positions without bending down – and no fiddling to pull out pop pins! The seat is removable and has three different heights that you can use, by simply sliding the seat rest into your chosen position. The seat also follows the backrest at any angle so it’s always perpendicular to the back to prevent you from sliding off when using the incline. The frame is made out of solid 11 and 12-gauge super strong steel with chrome components. It’s powder-coated to protect against rust and scratches. The backrest and seat cushions are heavy duty padding with stitched vinyl making it very comfortable and long-lasting. The bench measures 44″ by 10.25″ by 21″. What makes this bench a little different is that it’s made out of one long backrest with a separate seat attachment. So the backrest measures 44” by 10” and is 3” thick. It’s a very modern design and brings simplicity to a new level. The seat height from the floor can be 16”, 14” or 12” depending on your height. When the seat is at its highest position, the backrest pad measures 31” from the seat to the top. The total weight is 60lbs but has a mammoth 1000lbs weight capacity. This is where things can get fun! Or expensive. Ironmaster has a number of attachments you can purchase to make the most of your bench and give yourself even more workout options. But they’re all sold separately so you’ll need to factor that into the overall cost and how much you’re willing to spend. 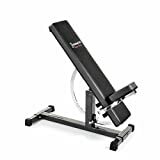 There’s the Ironmaster Crunch Sit-Up attachment for around $65 which allows you to use the weight bench as a decline bench for ab work. There are leg and knee raises to target the lower abdominal. You can also buy the pull up attachment. It’s pretty damn tall so you will have to store it when not using it. These are just some of the many attachments available for the Super Bench. The sky is the limit on how to expand this bench over time which no other bench I know of can do this. If there is please comment below so I can update my visitors. The bench comes mostly assembled, you just need to attach the feet but you should be able to do that fairly quickly by following the instructions so it’s a pretty hassle-free set-up. The company site said it can be put together in minutes as most of it is already put together. Hit the Easy button please! The bench has a limited 10-year warranty while the upholstery only has a one-year warranty. It’ll cover repair or replacement for mechanical integrity for home use only. Finish and wear items like rubber and painted surfaces won’t be covered by the warranty. The Ironmaster Super Bench doesn’t have any wheels attached to it. This can make it awkward if you have to move it around several times in a day. It only ways 60lbs so you can slide it around easy or just pick it up. You can buy a wheel attachment for it if this really becomes a problem. You have to buy the sit-up attachment if you want to do decline presses so you can actually hook your legs in safely to stabilizer yourself while you are pressing the dumbbells. This bench isn’t called “Super” for nothing. With 11 different angles this bench will help you target every muscle in your upper body. At 60lbs it’ll be sturdy and hold whatever weight you’re lifting. The design is quite clever so that you can add many attachments to it very easily. The foot lever makes changing adjustments incredibly straight forward too. The Super Bench is reasonably priced for a bench with this many options. A great option for all your weight-lifting needs and with the high weight capacity it’s ideal for those lifting heavy weights in a range of positions and need a solid and heavy-duty bench. You can find the discounted price here at amazon or read our adjustable bench review page here.